Crep Protect, the company that claims to be the "ultimate stain and sneaker repellent," continues to put its money where its mouth is with an awesome new video. Jumping on the Back to the Future II hysteria, Crep Protect recently released a video themed after the movie to show off its product on a pair of Nike Mags. 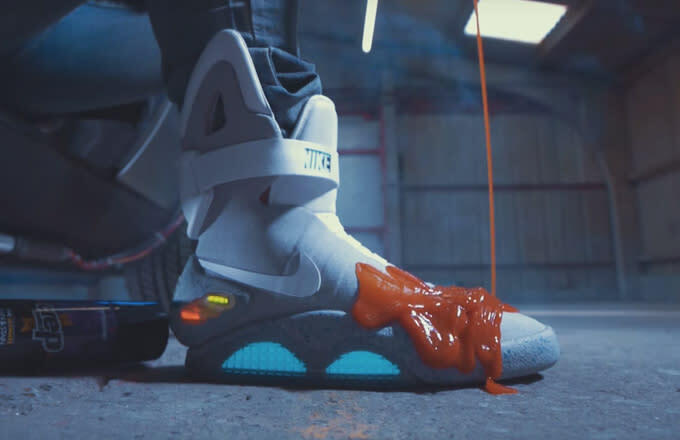 Stepping out of a DeLorean DMC-12, a character dressed as Marty McFly douses his Mags with a generous squeeze of ketchup - a scene that will undoubtedly have sneakerheads grimacing. The following scene is where the real magic happens as pouring water washes away all of the ketchup leaving the Mags absolutely absolutely stain-free. While we don't recommend doing this to any of your pairs, its good to know that Crep Protect is out there to, well, protect your sneakers.